All members of first place team will win a trip. One lucky member will have the opportunity to win an internship at one of the sponsors involved. Each team member of second place team will win tickets to Splish Splash water park. Each team member of third place will be awarded WiFi Hue Light controllable via Google Voice Assistant. In addition, each team member will be awarded one year free license to use all JetBrains IDE. 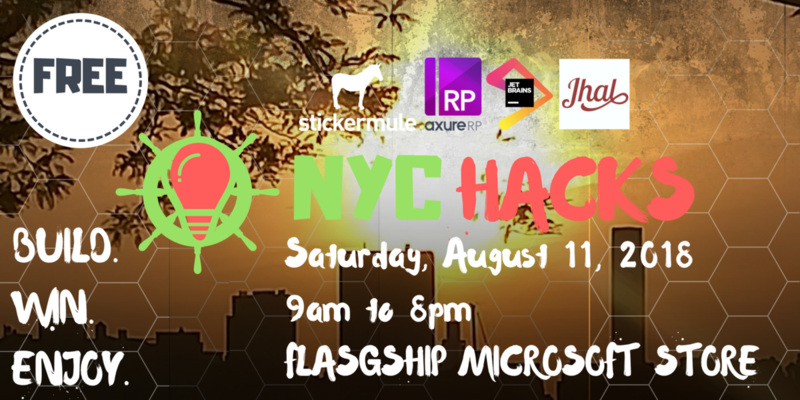 College students, show off your craftsmanship and creativity to build and deploy software/hardware at NYCHacks hackathon! Intro speech/Breakfast - 30 min approx. 5:00pm Attendees start wrapping up and uploading their code/code documentation to NYCHacks GitHub repository and start working on their presentation. Hackers will be given a main challenge which is shaped around the theme of the hackathon. Additional challenges will be kept in mind to allow everyone to be able to complete something. Hackers will be grouped into teams and compete to make the best mobile/desktop/web (or cross-platform) or api such that can be used in mobile/desktop/web apps.